Boats from Southerly Yachts may look like many other offshore cruising boats, but they have a trick up the trunk—the ability to combine the stability of moderate displacement and a heavy fixed keel with the versatility of a variable-draft swing keel. As anyone can attest who has dug a fixed keel into a shoal, or been on a boat that was too deep to get into a shallow gunkhole, or been thrown around on a twitchy variable-draft boat, this is an asset. I test-sailed the new Southerly 110 in the shallow waters of Florida’s Biscayne Bay to see just how stable, comfortable, and shoal-water-friendly an offshore boat can be. Wind speed was in the 12-knot range, seas were flat, and the sails were brand-new. In deeper water, with the keel down to its maximum draft of 7 feet, 2 inches, upwind boatspeed topped out in the low 6’s, the helm felt smooth with just the right amount of weather helm, and we tacked through 85 degrees. But things got really interesting as we approached thinner water. With the push of a button, the keel pivoted into its trunk, leaving just 2 feet, 4 inches extended, and we kept trucking along over shoals that would have stopped many keelboats in their tracks. Best of all, even with the keel fully raised, the boat’s heel and leeway did not increase excessively, and we were able to tack through 100 degrees. This is partly because Rob Humphreys designed the boat with a 2,310-pound keel and a 4,455-pound steel grounding plate in the bottom of the hull. 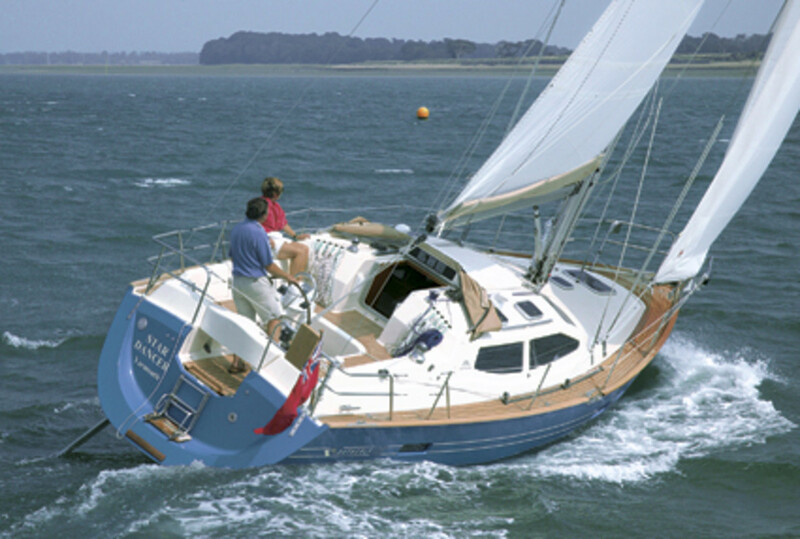 The keel retracts just like a centerboard on a trailersailer; a small hydraulic ram provides the power. The keel can go from fully down to fully up in less than a minute, even under sail, and can be manually pumped up if necessary. The grounding plate provides stability, significant ballast, and the structural support for the keel. Leeway was apparently limited by the lateral stability provided by the boat’s dual rudders and the skeg that protects the shaft-mounted prop. Another interesting design feature is the boat’s lack of chainplates. To increase interior volume, the deckhouse is sufficiently overbuilt to be able to accept rig loads. Shrouds simply attach to the top of the deckhouse. The trade-off for variable draft is often the need to build the interior around an intrusive keel trunk. On the 110 this problem has been solved by incorporating the trunk, plus the hydraulics for the lifting mechanism into a side of the boat’s galley cabinets and saloon. This reduces the stowage somewhat and puts the galley several steps up from the saloon. Cooks will love the views from the galley but may also find the countertop fiddles are a bit low. Navigators will find that the nav station is well laid out and also has excellent visibility outside. The saloon has two excellent seaberths and plenty of light and ventilation. The two sleeping cabins are about the size you’d expect on a 35-footer; the master cabin aft has a good-size double bunk, two hanging lockers, and additional stowage, while the V-berth forward is smaller with less stowage. The designers, engineers, and builders of the Southerly 110 have figured out a way to combine variable draft and offshore stability without sacrificing sailing performance, seakindliness, or interior comfort. If you find yourself constricted by shoal-draft cruising grounds or are looking for a 35-foot cruiser that is sturdy enough to handle the elements, check out the Southerly 110.